Hello, all! Simon’s January 2016 Card Kit went live a few days ago and I’m excited to share a card and video tutorial using the kit goodies plus a few Simon’s fabulous dies. This kits features lots of beautiful purples, blues and grays – wonderful selection of colors for a frosty winter. I went with frosty blues and grays and a hint of silver glitter for my project. The glitter tape included in this month kit immediately stole my heart (I am in love with all things glitter) and was put to a good use. I started working on this project by die cutting a panel out of beautiful sheet of patterned paper from my kit. I used Simon’s Stitched Rectangle Die and cut it using my Platinum machine from Spellbinders. I also layered a very detailed snowflake border cut out of silver mirror cardstock from my stash and topped that with a white layer with a faux stitched tiny scalloped border on top. I foam mounted two critters facing each other using thin foam adhesive from Scrapbook Adhesives, added a little die cut heart (cut using the hearts die from the Send My Love die) cut out of that glitter tape. I heat embossed “Sending flurries of Love” onto a piece of white cardstock using Hero Arts Silver embossing powder and added a layer of silver glitter tape underneath. I loved the silver outline so much that I decided to add a fake glitter panel behind my main die cut panel. I filmed a detailed video tutorial showing you how to make this card from start to finish. You can watch it at the top of this post or by clicking this link on my Youtube channel. If you like it, please give it a thumbs up and share. Thanks so much! Cute, happy, and wintry! Like how you tucked the snowflakes behind the snowbank! 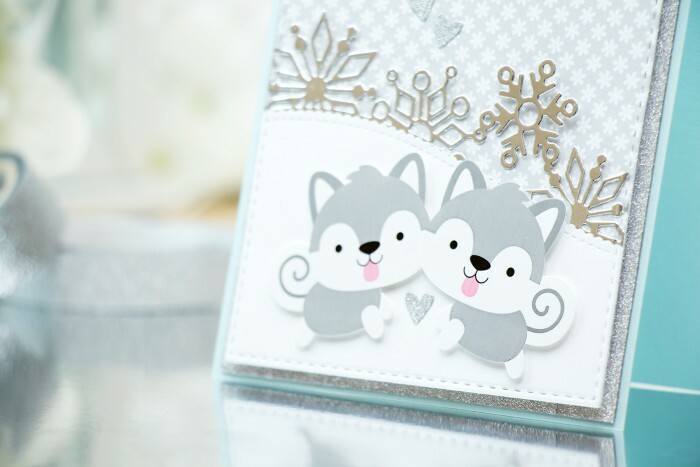 Very cute and very brrr card! An adorable yet stunning card Yana. I am so inspired. TFS! Merry Christmas! I love this post-holiday card. Those “pups” ? are soooo cute. Love your card ~ so cute. 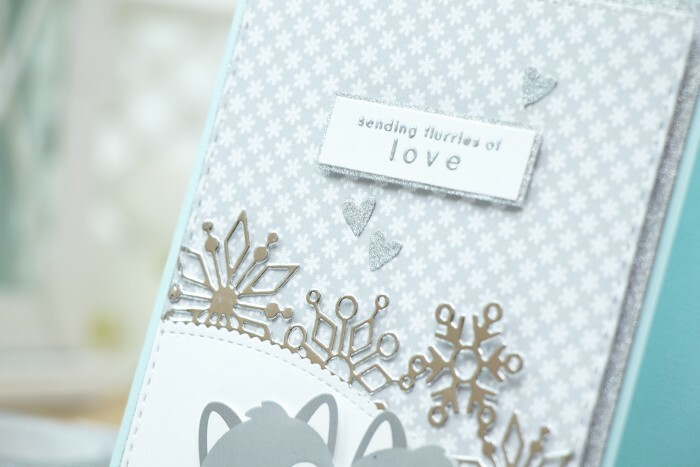 I think I “need” the snowflake border die & the wonderful wavy border dies! 🙂 The little critters are Huskies and they are adorable. I always check out your videos when the card kit arrives. You are my inspiration.